My Refrigerator Broke. Do I Really Need a Fancy, Stainless Steel, New One? | Just Me With . . .
Burnished steel looks like stainless and works with magnets. The simple fridge meaning no ice makers, water dispensers, side by side doors etc tend to break sooner than the simple freezer on top, fridge on the bottom 2 door models. I have a simple fridge in my basement that has outlasted 2 fancy ones in the kitchen. Buy the simple fridge, they come in white black and stainless. Pick your favorite. I ended up getting this one fixed (partially) because of insurance. But rest assured, when I need to buy a fridge, I’m going for a simple, reliable one. Thanks for reading. Thank you. People need to know what they are getting for their money. Hear! Hear! 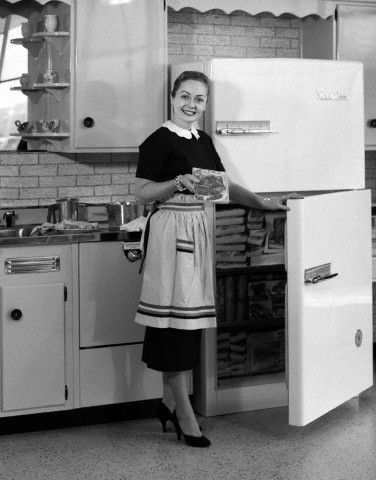 Our house came with a 1950 General Electric Fridge that’s still truckin’. Yeah, we have a separate freezer in the basement because the freezer inside can barely hold a gallon of ice cream. Also, we have to defrost every couple of months, which is a pain, but means we never have any mystery food in the thing. Also, energy consumption’s not great, and it’s so heavy that they had to reinforce the floor when they installed it. But c’mon, it’s 65 years old and WORKS. No fridge on the market today will ever beat that! Last but not least, it looks super snazzy! Very cool. No pun intended. I don’t think the appliances made today will still be working in 65 years. No way. Ugh, I am sick to death of HGTV telling us what we like/need. Their taste is not rooted in classical design, real life function, or history. Not only that, I’ve heard rumors that copper is going to start being touted as the new metal cladding for high end appliances which will require everyone to buy new appliances to keep up. The only frill on my basic, off-white fridge is that it’s “freezer on the bottom” which keeps me from having to bend over for stuff I need more often. The freezer drawer is a little small but it encourages you to eat more fresh than frozen foods. Yes, we are encouraged to buy new appliances because of style, not function and that’s wasteful and a little crazy. 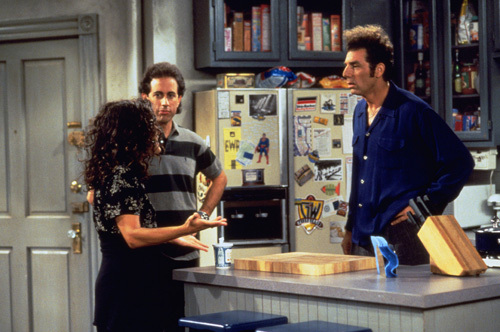 I just saw on a local online posting someone selling their refrigerator and dishawasher that work perfectly and are not old and have nice features but the homeowners are simply “updating.” Really? Geez. Keeping up with the Jones on HGTV. You are so rights about the trends not taking into consideration real life function and history. As to history, the common rhetoric is that the reason why kitchens were closed before is because everyone had servants. Well, not everyone had servants. Even the homes of the “servants” had closed kitchens. My parents’ and grandparents’ homes had closed kitchens. They did not have servants. Kitchens were in the back of the house because of fire concerns (no one seems worried about kitchen fires anymore that would destroy the whole first floor because of the one room thing. Also, the common theme is that closed kitchens kept the ladies of the house in the kitchen cut off from the other people. Yet at the same time open floor plans are supposed to be good because the lady can still be in the kitchen yet see everyone else. Meh. And don’t get me started on kids and dogs. It’s unsafe to have a toddler crawling around a kitchen. Sometimes you need to just be done in there and close a door. And pets? Yeah, same thing. It would be nice to keep them out of the food preparation area or away from guests who are allergic or bothered by them. When it’s all one big room, the poor dog gets banished outside or locked in a bedroom more often. And when there is no food out, a closed kitchen is a nice place to banish a dog when people come over. Warm, floor is an easy cleanup, etc. Guests don’t need to go in there, etc. Copper? Copper is pretty. But not so pretty that I would spend thousands of dollars on it to replace an appliance that still works. 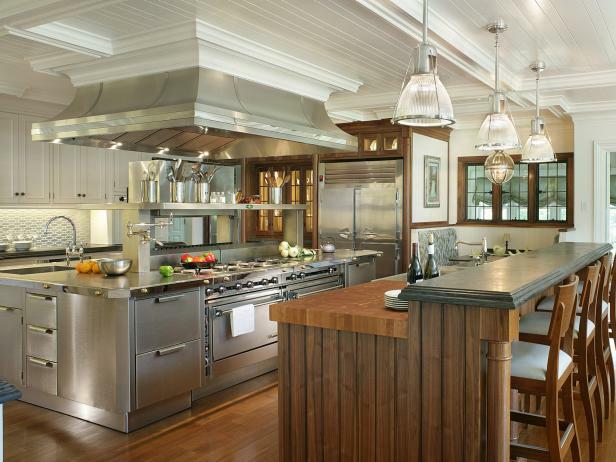 Kitchens don’t really need to be trendy. They need to be a welcoming, safe place from which good food is stored and produced. The host is the most important in entertaining. I’ve been to the best parties where I didn’t give a second thought to the kitchen. When I had an open floor plan I had a big party once, catered wedding rehearsal dinner. Frankly, it was awkward, because the caterers were on display and we were on display to them. Everyone saw their prep and clean up. And I kept looking to make sure they were not breaking anything. And I could see them whispering to each other about the guests at the party. Awkward. Anyway, the servants argument annoys me. Not everyone had “servants.” And old-fashioned traditional housewives groomed to entertain knew to prepare the meal ahead of time and then spend time with guests, not make the guests watch her cook. Again, don’t get me started . . . I don’t like to spend all day in the kitchen. I’d like to get away from it. You can’t when it’s always there. I love your posts on the open kitchen and now in the shiny stainless steel appliances. I am currently house hunting and I am hard pressed to find a home with a closed off kitchen. And you are so right these shiny new stainless steel appliances are the new adult toys. Totally not necessary. As far as the type of refrigerator goes, I would go for one that does it’s job. The one that I have is old and it does give me some problems now and then. I think you are right that TV shows push us to go out and buy the fanciest ones with a ton of features. I could care less if it had a touch-screen or a water dispenser. If it does what it says it is supposed to do, I’ll be happy. That’s the way I feel. I got this one back to life, but without the bells and whistles. And I’m perfectly okay with that. Amen!!!!!! I like solitude. But, if your whole house is one big room, there is none. People need their privacy. I don’t want to listen to everyone’s noise. My father-in-law took a look at our 35 year old refrigerator, and insisted we needed a new shiny one. I insisted back that we did not. This one will keep on working past the time that everyone is dead. It is a great beige color that goes with the tile and the cabinets. I really dislike kitchens that look like a McDonalds restaurant. I don’t want commercial – industrial looking, I want warm and cozy. I don’t understand people that replace perfectly good things, just to “update”.